Today in the Ministry of Industry and Trade of Tatarstan, representatives of Turkish-based ABT Yapı explored the republic’s industrial potential during their first visit to Tatarstan, and also voiced their intentions to expand the corporation’s geography. “We want to expand our activities in the territory of Russia - we are interested in Tatarstan in the fields of industry, construction, and investment,” said Erkan Yıldız, company’s Deputy Director General. The meeting was chaired by Deputy Minister German Lerner. - SONELGAZ (Algeria): construction of a 700 MW power station, and others. CCIP: lowering loan rate by 4.5%! The International Cooperation and Exports National Project is used to support manufacturing enterprises that implement corporate competitiveness improvement programmes (CCIP), that are programmes of organisation’s activities aimed at improving competitiveness, increasing production output and sales of their products. Such enterprises can be provided with loans on easy terms and conditions (subsidising the credit rate up to 4.5%) for the creation of export-oriented facilities in Russia and abroad, as well as for export finance (pre-export, post-export), factoring, loans to foreign buyers of company’s products, payments for funding insurance premiums under the export credit insurance contract. Minimal requirements for participants include: 1. Confirmation of the fact of production in accordance with the Resolution of the Russian Federation Government No. 719; 2. Absence of delays and debts to the budget and extra-budgetary funds; 3. Neither a foreign legal entity, nor an offshore company, and has not been in the process of liquidation or bankruptcy for the last 3 years. The CCIP requirements, the procedures for selecting and forming a single register of organisations are governed by the Resolution of the Russian Government No. 191 of February 23, 2019. Companies’ applications will be collected later in April. The application deadline is May 15, 2019. This week at the MGIMO University, the cradle of Russian diplomacy, a high-level meeting was held with students coming from Tatarstan. The meeting was attended by Deputy Minister Almaz Khusainov. He introduced the younger generation to the industrial potential of the republic, spoke about the development strategy and achievements of Tatarstan. While expressing interest, the students asked questions about whether Tatarstan companies organise trainings for employees in other regions of Russia and abroad, what work experience is needed, whether their unique diplomatic skills will be useful and other questions answered by representatives of Tatarstan companies present at the meeting: Tatneft, KAMAZ, and SEZ Alabuga. “The meeting was conducted at a good level, mutual interest and understanding were indicative in the sense that enterprises of Tatarstan are interested in the best young professionals”, Almaz Khusainov said. Also during the visit, the Deputy Minister had a meeting with MGIMO Principal Anatoly Torkunov. 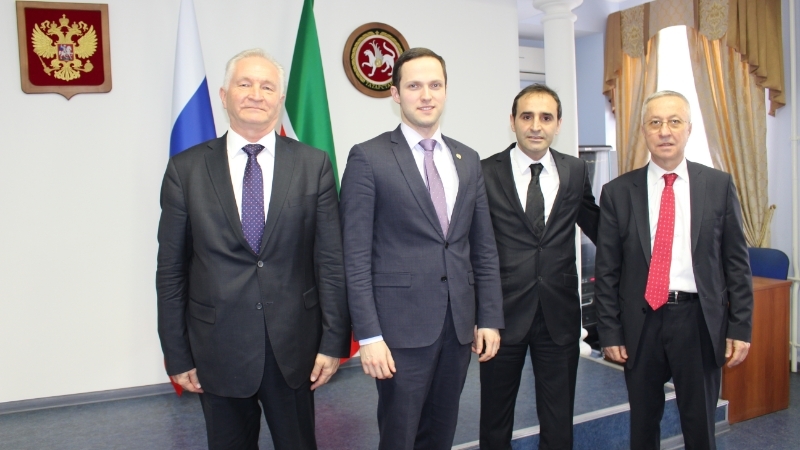 The Ministry of Industry and Trade of Tatarstan was visited by executives of TEMPO holding. Company’s management was interested in the conditions of the corporate competitiveness improvement programmes (CCIP), as well as measures to support exporters. TEMPO is active in developing exports activities, both by expanding its geography of product sales and by seeking new areas of activities. The meeting was chaired by Minister Karimov, explaining that the selection of enterprises takes place on a competitive basis, but the Tatarstan Ministry of Industry and Trade is prepared to give all explanations if there are any questions in this respect. Within the CCIP framework, manufacturing enterprises can be provided with concessional loans (subsidising the credit rate up to 4.5%) for the creation of export-oriented facilities in Russia and abroad, as well as for export finance (pre-export, post-export), factoring, loans to foreign buyers of company’s products, payments for funding insurance premiums under the export credit insurance contract. The CCIP requirements, the procedures for selecting and forming a single register of organisations are governed by the Resolution of the Russian Government No. 191 of February 23, 2019. Companies’ applications will be collected later in April. This week, the All-Russian No-Turnstile Week career guidance campaign took place in Tatarstan, as well as in other Russian regions. More than 40 enterprises of industry and commerce of Tatarstan (compared to 24 enterprises in 2018) took part in it by opening their doors to more than 2,000 schoolchildren and students from the republic. During the visit, the students visited research and production departments and laboratories of enterprises, assembly shops, made tours of history museums, and took part in meetings with executives, successful workers, and long-service employees. All this should form a system of early vocational guidance for adolescents and young people, aimed at the development of domestic engineering and manufacturing industry in general, as well as in an interactive introduction of schoolchildren, students, and their parents to industrial companies’ activities. We thank all the companies for their active work in the campaign!